I noted that Pace has installed bus stop signs on Pfingsten, Willow, and Sanders for route 270. That portion is basically a loop for Glenbrook Hospital rush hour trips to serve Allstate on Sanders, but up to now hasn't generated any ridership itself (among other reasons, it would be about a 1:20 trip to Jefferson Park). Does anyone know if this is a precursor to making 270 (which has been proposed for ART) a Posted Stops Only route? Take it for what it is worth I guess. FWIW, there is also a whole bunch of new signs on Lake between Milwaukee and Pfingsten were there weren't any signs before. I think it's just a service improvement. If there's no bus sign it's more than likely you'll get passed up. Service from Glenbrook hospital to Jeff can take as little as 50 minutes, if they avoid the Central avenue (Glenview) turn. Some rush trips do this. This can shave off 10 minutes. The bigger issue is traffic. I'm surprised the #272-#270 connection gets as much traffic as it does, a trip from Hawthorn to Jeff is about 2 hours. I think it's just a service improvement. If there's no bus sign it's more than likely you'll get passed up. No, I don't think that's it, since most are low yield stops and you are also dealing with posting both sides of a loop that runs one way or the other during rush hour, and hence there are 50% odds that someone would be on the wrong side of the street. Also, the schedule for all trips from Glenbrook Hosp. include Crestwood Apartments, and I don't see how they can skip a portion of the route inbound plus hit the layover point at Golf Mill and leave it ahead of schedule without messing up the interval south of Golf Mill. On the other hand, 272 and Aon trips are not scheduled to go on the Crestwood Apartments segment. Hence, I think Railway Modeler is on the right "track," although Pace has sort of clammed up lately. I guess your right, it is just the Aon trips that skip the Crestwood apartments. As far as the interval at Golf Mill it doesn't matter when you have buses coming from all directions to become #270's every 10 minutes. Most are usually behind, due to traffic and don't have much layover anyway. As far as to elaborate further on the posted signs topic, maybe they are trying to raise ridership with the signs. If no one on the street or in a car knows about the bus, there not going to decide to take it either. ... If no one on the street or in a car knows about the bus, there not going to decide to take it either. Again, I would question that motivation in this case, in that, besides it going one way or the other on the loop, it is only on rush hour. Isn't going to do much good on the weekends, either. Of course, anyone riding Pace shouldn't do so without reading the schedule, but I doubt that seeing a bus stop sign all the sudden rings the bell that (1) the bus goes by here and (2) I better go to pacebus.com, Golf Mill, or probably more worthlessly, goroo or the RTA number to get a schedule before trying this. It might on the margin. 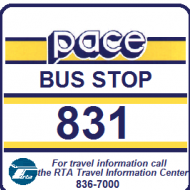 It probably is like Pace posting that 623 makes an additional stop and then posting two bus stop signs there. Either people work at that company, or don't have a reason to be waiting there for a bus (especially outbound). Turns out I was right. Passenger notices are now posted that 270 and 250 will be posted stops only, effective May 13. On Milwaukee Ave. itself, the signs are too close together to be ART. I did see that Dempster did get new bus stop signs. Holy Nercoposts, fellow bus fans…The 290 is next on the Posted Stop list! All routes are slated for this in the future. I remember a few years ago on West Roosevelt in Lombard, there were not many bus stop signs. They might have to put up a few signs here and there especially in rural sections like on the #272 or #301/ex #747 territory. So what happens when there are no side walks or its winter and no plowed walk ways how do passengers get from piste stops to destinaction? That was essentially the situation on 529 Randall Road, and basically they said that a safe access, pad, and shelter had to be provided. However, with the proposal to eliminate service on Randall Road between IMSA and Batavia, that becomes moot. Legally speaking, Posted Stops Only is a better idea, because the transit authority is responsible for providing a safe place for ingress and egress. The TA would incur liability if it just dumped off a passenger at a snow pile because the passenger requested it. However, that does raise the issue about who shovels out the bus stop (something a lot of people complained about with regard to CTA last winter, and, of course, CTA has solely a posted stop policy). About damn time! It's a nightmare being on that bus in the city limits, especially when I take my kids to Chuck E Cheeses! However, if you had read the article, it referred to Niles and Park Ridge. As I noted above, within Chicago appears to be all posted stops, whether CTA or Pace. Also Re: 550 (with the expansion mentioned previously) will be posted stops as well. Yeah I know. Maybe it can help with time congestion because during my last two trips out there #290 was over 20 minutes late. Keep an eye on Route 834 in Dupage/Will County. 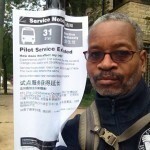 Over the weekend, they changed existing bus signs when that route goes down 63rd St and labeled them "H" routes only. In addition, they added newer stops along both routes (75th and 63rd streets) that were not in existence before. Prior to this, there were no bus signs at all once you're past the intersection of 63rd/Main St in Downers Grove. I wonder if customers and/or drivers were complaining, but I wouldn't be surprised if this route becomes "posted stops only" very shortly. I'll second that bet. Pace seems like they are moving a lot more quickly toward converting the entire system. Those "H Trips" signs are part of the new standard for trip variants, and putting signs along both route segments covers most of what is left of that route that didn't already have signs. I noticed yesterday the new bus stop signs on 834 have been placed as far south as Taylor Road in Romeoville. I don't know if the Lockport to Joliet segment is done yet. I also noted that they went ape with new bus stop signs in the Highland Park/Deerfield area, not only signs on the reconstructed part of Deerfield Road, but also on Waukegan Rd. and Lake Cook. I guess making 471 the next priority is coming, like that's really necessary.